The world premiere of the short film Evidence will take place at the Strand Theatre in Clinton, Massachusetts on January 20. 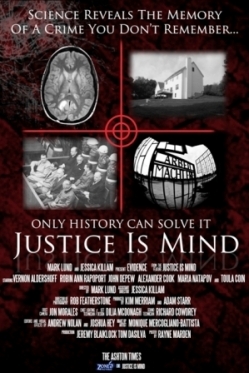 Production launches crowdfunding campaign on IndieGoGo to produce feature length version Justice Is Mind. Jan. 9, 2012 - PRLog -- Mark Lund, Executive Producer, and Jessica Killam, Producer, are pleased to announce the world premiere of Justice Is Mind: Evidence at the historic Strand Theatre in Clinton, Massachusetts on January 20. Evidence will debut after the feature length film J. Edgar. Written by Mark Lund, in Justice Is Mind MRI technology has advanced to a point where imaging of long term memories can be produced in near video quality. When local businessman and restaurant owner Henri Miller has the new FVMRI scans and it reveals him murdering two contractors on his property, the first Superior Court trial begins in which a defendant’s own memory can be introduced as evidence. Evidence [http://www.imdb.com/title/tt2117894/] begins in the chambers of Judge Richard Wagner when motions are presented by Henri’s defense counsel in a desperate attempt to suppress the key memory evidence of the alleged double murder. The story continues at the Miller residence with Henri growing more unstable and his journalist wife, Margaret, attempting to bring some normalcy to their situation—a futile attempt when the news of Henri’s fate is broadcast to the world. The short film version Evidence was produced to introduce the concept of Justice Is Mind and to act as a capital raise vehicle to produce the feature length version this coming summer. In concert with the producer’s capital raise activities, the production has launched a crowdfunding campaign on IndieGoGo [http://www.indiegogo.com/Justice-Is-Mind?a=339675] to further interest in the project. Evidence stars Vernon Aldershoff(Henri Miller), Alexander Cook (John Darrow), Maria Natapov (Constance Smith), John Depew (Judge Wagner), Robin Rapoport (Margaret Miller) and Toula Coin (News Reporter). The film also introduces Joshua Hey (Brian Miller) and Kim Merriam (Court Stenographer). Admission to J.Edgar and Evidence is $5.50. Doors open at 6:15 with a 7:00 PM start time. The Strand Theatre [http://www.strandtheatre.com/] was built in 1924 and is one of the oldest existing movie theatres in the area. Operated as a vaudeville theater and movie house until the late 1970s, the Strand was completely renovated and re-opened in March of 1995. The Strand Theatre offers a unique twist in movie entertainment. Known in the trade as a Cinema Pub, Drafthouse or Grille, the Strand Theatre offers movie patrons the ability to enjoy a casual light meal and drink while watching a current motion picture on the big screen, with state-of-the-art sound and service in a comfortable and relaxing atmosphere. The Strand Theatre features one of the largest screens in Worcester County. The Strand Theatre is locally owned and operated. Mark Lund is an award winning magazine publisher, thrice award nominated screenwriter, television personality, producer, director, actor and writer. He has produced and directed for the screen (First World), television (direct response commercials) and stage (Becker College). As a TV personality, Lund starred on FOX’s Skating With Celebrities and served as a TV analyst for the sport of figure skating for over ten years most notably for CNN during the 2002 Winter Olympics in Salt Lake City. He is the author of Frozen Assets and First World: Covenant. Additional information can be found at this link http://theashtontimes.com/about/. Jess Killam is currently a Junior attending Fitchburg State University for video production. She has produced student films and done various other crew work on films from Emerson College and Fitchburg State as well as stage managed numerous plays. She had her stage directing debut this past December with Brilliant Traces. She is also serving as assistant director for Justice is Mind: Evidence.